Samoa's World Cup team manager Tuala Mathew Vaea has been hit with a fine of 100 pigs as a result of allegations concerning his behaviour during the showpiece tournament. Samoan captain Mahonri Schwalger had previously slammed the team manager accusing him of cutting their allowance and showing disrespect to the players and coach throughout the tournament. "He [Tuala] is hardly at the hotel organising and scheduling our programs for the week, like what a normal team manager would do," Schwalger said. "All the players do not respect him and they would never go and ask him for anything, as they do not trust or believe in him. "When players call him by his first name he would turn around and reply in a blunt and angry manner as he wanted to be called Tuala." And as a result of Schwalger's criticism of Vaea, the chief of the team manager's village fined him 2,000 Samoan tala (£530) - the equivalent of 100 sows. "He paid a cash fine of $2000 instead to the village and gave a formal apology that the chiefs of Leauva'a have accepted," Vaifale said. "The title of Tuala has received bad publicity in the media because Tuala Mathew failed to perform some of his duties as the manager for the Manu Samoa." 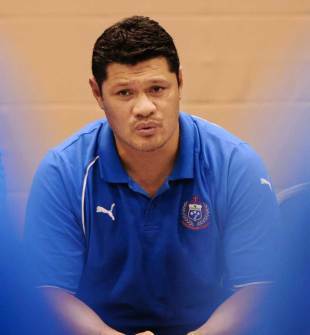 Vaea has since denied Schwalger's claims but said on local radio: "Samoa, if I have erred in my duty as the team manager, please forgive me."